The Manchester Shop sells all things Manchester related and is home to their own brand Manc and Proud. Clothing for adults and kids, giftware, jewellery and souvenirs. Based in Afflecks on Oldham Street in the heart of the Northern Quarter and is open 7 days a week. 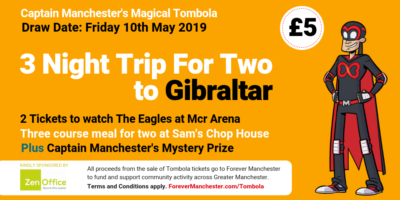 They have already raised £6,657 for Forever Manchester to fund and support community activity across Greater Manchester. Established in 2016, Manc and Proud was created from the love of bees, Britpop and chip butties. They wanted to create a brand that spoke to all Mancunians, whether you were born and bred in Oldham or you came here for uni and liked it so much you stayed. In the wise words of Ian Brown, “It’s not where you’re from, it’s where you’re at”.